Many patients treated with FCR achieve durable complete responses, but outcomes data is lacking in areas. 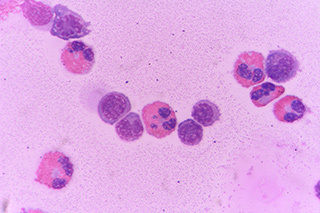 Patients with chronic lymphocytic leukemia (CLL) who have a remission duration lasting less than 2 years after fludarabine, cyclophosphamide, and rituximab (FCR) therapy have dismal prognosis, comparable to those with primary refractory disease, according to findings published in the European Journal of Haemotology. However, longer remissions indicate chemo- and immunotherapy sensitive disease, and patients who discontinue FCR due to adverse events (AEs) may still achieve excellent responses and outcomes with subsequent therapies. FCR is a highly effective treatment regimen for patients with CLL, with many patients achieving durable complete responses. However, outcomes data for a subset of patients who initially have refractory disease, experience relapse early, or are unable to complete therapy due to toxicity is lacking. For this retrospective study, researchers assessed the outcomes of 126 patients with CLL who were treated with first-line FCR; 41, 9, and 13 patients eventually received second-line therapy due to relapse, refractory stable/progressive disease, and prior toxicity, respectively. The median follow-up for the study was 67 months overall, and 37 months from second-line therapy. Results showed that patients with time-to-next-treatment (TTNT) of less than 2 years had shorter postsalvage treatment overall survival (OS2 19 months), which was comparable to the 23-month OS2 among patients with primary refractory disease. These patients also had a short event-free survival after salvage therapy (EFS2 12 months); patients with primary refractory disease had an EFS2 of 9 months. Patients who had a TTNT of at least 2 years had an OS2 and EFS2 of 48 months and 20 months, respectively. Patients who discontinued FCR due to AEs who received second-line therapy had an EFS2 of 41 months, and 59 months from the start of FCR therapy.